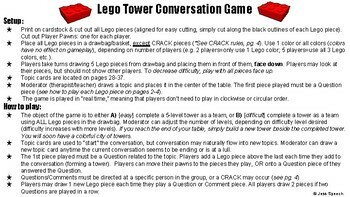 This Lego Tower Conversation Game is meant for working on conversation skills, such as, asking questions, making comments, making personal connections, and topic maintenance. 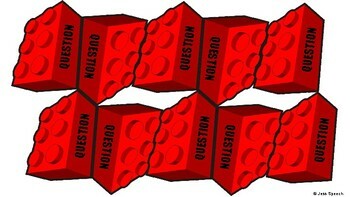 Basic gameplay: Players play Lego pieces (Question, Comment, or Connection) to build a Lego tower together as they have a conversation in "real time," but watch out, an Off-topic piece will initiate the "repair sequence" (2 comments + 2 questions). The repair sequence is used to teach and practice repair strategies for breakdowns in conversation, as well as learning opportunities to observe the effects of our off-topic or unexpected behaviors. Repair phrases are also provided on visual cue cards to help repair conversation breakdowns smoothly. When communication breakdowns occur in the flow of conversation (negative comments, turning body away, asking too many questions, etc. 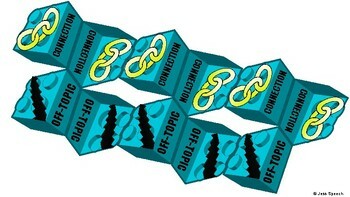 ), the moderator (therapist/teacher) can also put a cracked Lego piece on the tower, which initiates another repair sequence! Keep the conversation going as long as you can to create a 10-level tower (easy) or use all of the Lego pieces in the drawbag (difficult) to build a colorful tower city. 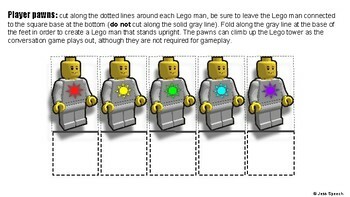 -Printable Lego pieces in 3 colors for gameplay: Questions (90 Legos), Comments (99 Legos), Off-Topic (15 Legos), Connections (18 Legos), and CRACK pieces (22 Legos).